The Beam Melting Network was founded in 2010 by a group of seven enterprises and three research institutions. Unitl 2013, it was funded within the Central Innovation Program SME (ZIM) by the German Federal Ministry of Economic Affairs and Energy (BMWi). The network bundles know-how for the beam melting technology in a unique way and therefore covers the full process chain, ranging from powder production, machine development and manufacturing, technology development and process optimization to applying beam melting technology in several industrial key sectors (mold and die making, medical technology, prototyping). This network aims to further develop the beam melting technology including peripheral processes, clustering SMEs, large industry and research institutions, to open up new fields of application for beam melted components. In this context, the realization of R&D projects is at the center of attention of the network's activities. The Fraunhofer Institute for Machine Tools and Forming Technology IWU is research and development partner in the field of production technology for the automotive and machine tool industry. A main focus of the Fraunhofer IWU's work includes the development of intelligent production systems for the manufacturing of car bodies and powertrain components, as well as the optimization of their related forming and cutting manufacturing processes. The Fraunhofer IWU creates innovative solutions for continuous process chains, from components to assembly units, all the way up to complex machine systems and completely new kinematics in which lightweight structures and the application of new materials play an important role. 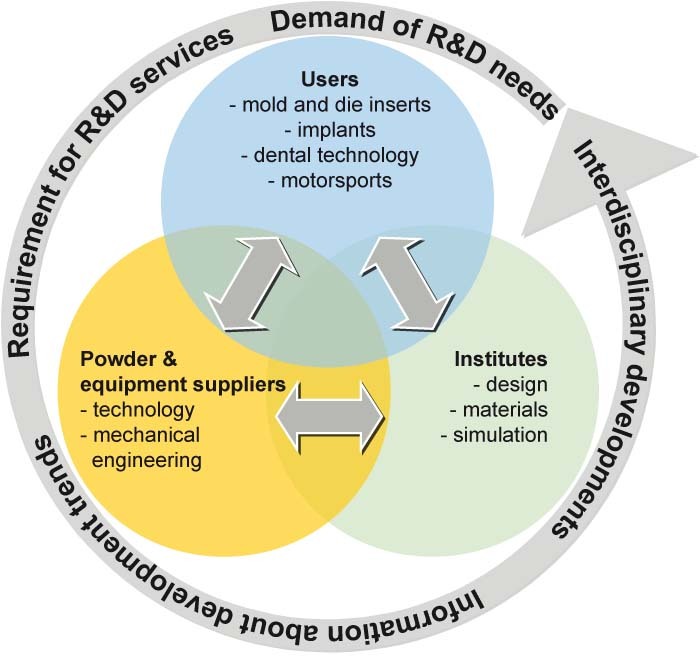 The core competencies of the Fraunhofer IWU are complemented and supported by the application of additive manufacturing processes. The production of metallic components by means of beam melting technologies enables the Fraunhofer IWU to demonstrate its industrial partners new ground in the development and manufacturing of innovative components and tools.